NASCAR® star Jeff Gordon and Action Performance Companies Inc., the leader in the design, promotion, marketing and distribution of licensed motorsports merchandise, today announced the upcoming release of a "fantasy" race car collectible that features cartoon character, Mighty Mouse. The proceeds from sales of the No. 24 Mighty Mouse 2005 Chevrolet Monte Carlo collectibles, which was designed by the creative staff at Action Performance, will benefit charities supported by The Jeff Gordon Foundation, the personal philanthropy started by the four-time NASCAR Cup Series champion in 1999. Action Performance will produce the vehicle in a 1:24-scale edition. The car showcases Mighty Mouse in his familiar "flight" pose as seen on Mighty Mouse Playhouse that originally aired on CBS television from 1955-1967. As this year marks the 50th anniversary of Mighty Mouse’s television debut, a special "50 years" logo also is included on the car’s decklid. The car also features the new official Jeff Gordon Foundation logo. The union of Mighty Mouse and The Jeff Gordon Foundation stemmed from Gordon’s own childhood appreciation of the cartoon icon. In fact, each die-cast collectible package includes a pairing of the "super" duo with a photo of a 3-year-old Jeff Gordon in his favorite Mighty Mouse T-shirt. For the next two years, Mighty Mouse will be a featured character associated with The Jeff Gordon Foundation since the organization obtained licensing rights for the cartoon character from Nickelodeon & Viacom Consumer Products, the licensing division of Paramount Pictures. "I was a huge fan of Mighty Mouse as a kid, and I’m still a big fan today," Gordon said. "Growing up, I always looked forward to Saturday mornings to see how he was going to ‘save the day.’"
In 2001, The Jeff Gordon Foundation began issuing fantasy die-cast collectibles so that collectors and fans could share their support and easily contribute to various charitable organizations. The initial success of the die-cast program ensured it would become an annual benefit for The Jeff Gordon Foundation. 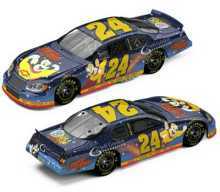 The most recent release was a "Holiday" car, designed by artist Sam Bass, which debuted in late 2004. It was the first vehicle released from The Jeff Gordon Foundation as a holiday special. The Jeff Gordon Foundation focuses its efforts primarily on children’s causes and family-oriented charities, including The Leukemia & Lymphoma Society, The Make-A-Wish Foundation, Riley Hospital for Children and The Marrow Foundation in partnership with the Hendrick Marrow Program. "Nickelodeon & Viacom Consumer Products is thrilled to partner with The Jeff Gordon Foundation to bring the beloved Mighty Mouse property to life for such an amazing cause," said Sherice Torres, vice president, hard goods, Nickelodeon & Viacom Consumer Products. As with past die-cast releases from The Jeff Gordon Foundation, the 1:24-scale No. 24 Mighty Mouse Chevrolet fantasy collectible will be available through Action’s standard distribution channels. To reach an Action Racing Collectables distributor, call the locator line at 1-800-411-8404. The Racing Collectables Club of America can be reached at 1-800-952-0708 or visit RCCA online at www.goracing.com. "We always welcome the opportunity to share in these special die-cast programs with The Jeff Gordon Foundation because they ultimately benefit so many people, especially kids," said Fred Wagenhals, Action Performance’s chairman, president and CEO. "Jeff is really proud of what his Foundation has done for so many groups in the past six years. His enthusiasm is part of what makes these programs so worthwhile." In addition to the die-cast replica, a full-size No. 24 Mighty Mouse showcar will be on display at various locations throughout the year to support and promote The Jeff Gordon Foundation’s fund-raising and marketing efforts. Children and families are the heart and hope of our future. Each child is special and deserves every opportunity for a safe and healthy life. The Jeff Gordon Foundation is dedicated to help support the physical, social and intellectual needs of children and their families throughout the United States. By awarding grants to needy and worthy causes, The Jeff Gordon Foundation will benefit organizations that reflect the values and concerns of Jeff Gordon. As a public, not-for-profit 501 (c)(3) organization, the Foundation is devoted to helping those in need. For more information on The Jeff Gordon Foundation, please visit www.JeffGordonFoundation.org. Nickelodeon & Viacom Consumer Products is a part of Nickelodeon Enterprises, the ancillary business unit of Nickelodeon Networks. It is responsible for licensing Nickelodeon brands and characters as well as the properties of Paramount Pictures, Comedy Central, Spike TV and MTV International, as well as some non-Viacom properties. Nickelodeon Enterprises is active in all ancillary markets, including merchandise licensing, home video, interactive software, electronic media, online, wireless, book and magazine publishing, music, live tour and stage shows, theme parks and themed hotel venues. Nickelodeon Enterprises manages the largest TV-based licensing business in the world with $4 billion in retail sales. Nickelodeon, Comedy Central, Paramount Pictures and Spike TV are trademarks of Viacom International, Inc.